Enter the integer as a number. Note that the latest version (as of 1/30/2017) of the TI-84 Plus CE operating system is used. For example, the number 49_12 in base 12 would read 4 dozen, 9 singles. Its decimal equivalent is 4*12 + 9 = 57. The number 24;53_12 in base 12 would be equivalent to 2 * 12 + 4 + 5/12 + 3/144 = 455/16 = 28.4375 in decimal. Note that the semicolon is used as the fractional point. The dozenal equivalent is 138_12 (1 * 144 + 3 * 12 + 8). I will add that we have 12 months in a year, non-military clocks have work in 12 hours (with an AM/PM indicator), and in most astrological practices where Ophiuchus the Serpent Bearer isn’t included, there are 12 signs of the zodiac. The factors of 10 are 1, 2, 5, and 10. The factors of 12 are 1, 2, 3, 4, 6, and 12. Base 12 advocates argue that the increase in number of factors would make more fractions easier to represent in dozenal than in decimal. Examples include 0;2 for 1/6, 0;3 for 1/4, and 0;4 for 1/3. Base 12 would also facilitate counting, instead of using two hands and their fingers, people would count using the twelve phalanges of a single hand, where the thumb is used as a counter. One hand can represent singles while the other represents dozens. * A for 10 and B for 11. These symbols would align with the hexadecimal representation. * An upside down 2 for 10 and upside down 3 (Ɛ ) for 11. In Microsoft Alt codes, the Ɛ is associated hexcode 0190. These symbols are popular in Britain. No offense, but personally, these are not my favorite as look confusing and too close to the 2 and 3 we have. * Another set of symbols are called dek (χ ) for 10 and el ( Ɛ except the bottom line is flat) for 11. These two symbols have been suggested by William A. Dwiggins, and is used in The Dozenal Society of America’s publications. For typing on the computer, the capital letter X stands for dek and capital letter E for el. For the purposes of this blog and the tables presented, I will use X for 10 and E for 11. 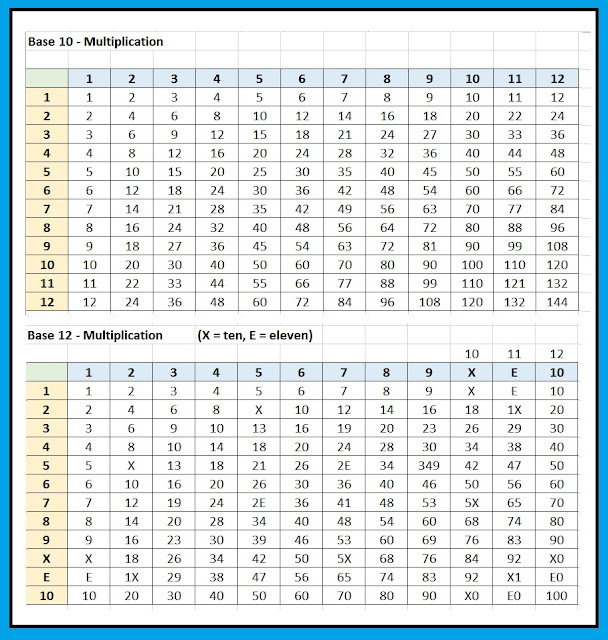 Let’s compare how the basic operations addition and multiplication work in both decimal and dozenal. 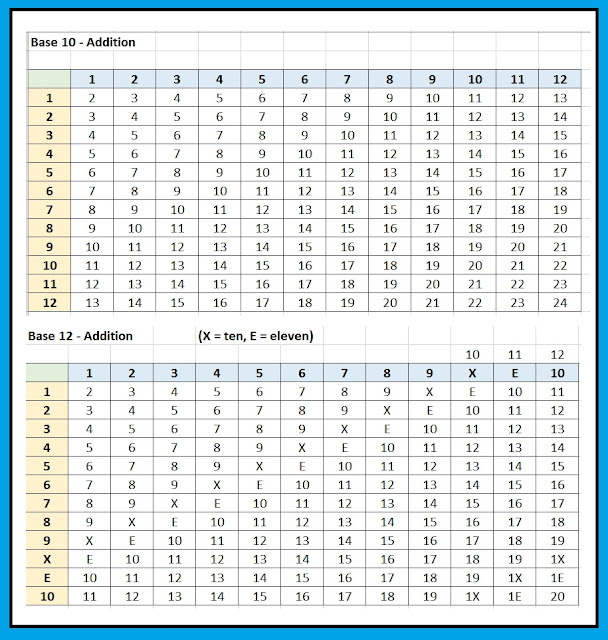 Below is an adding table (jpeg image) for numbers 1 through 12 represented in both Base 10 and Base 12. 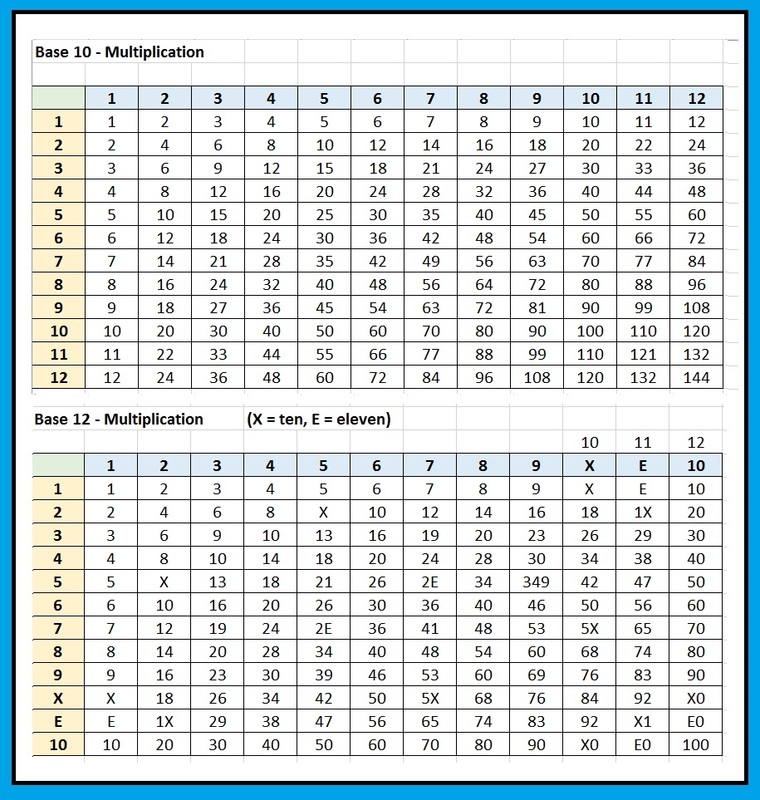 Below is a multiplication table (jpeg image) for numbers 1 through 12 represented in both Base 10 and Base 12. Here are some common fractions listed below in both decimal and dozenal systems. Note the interesting patterns for 0.1 to 0.9 (the table to the right). What do you think, would a dozenal, base 12 system work for you? 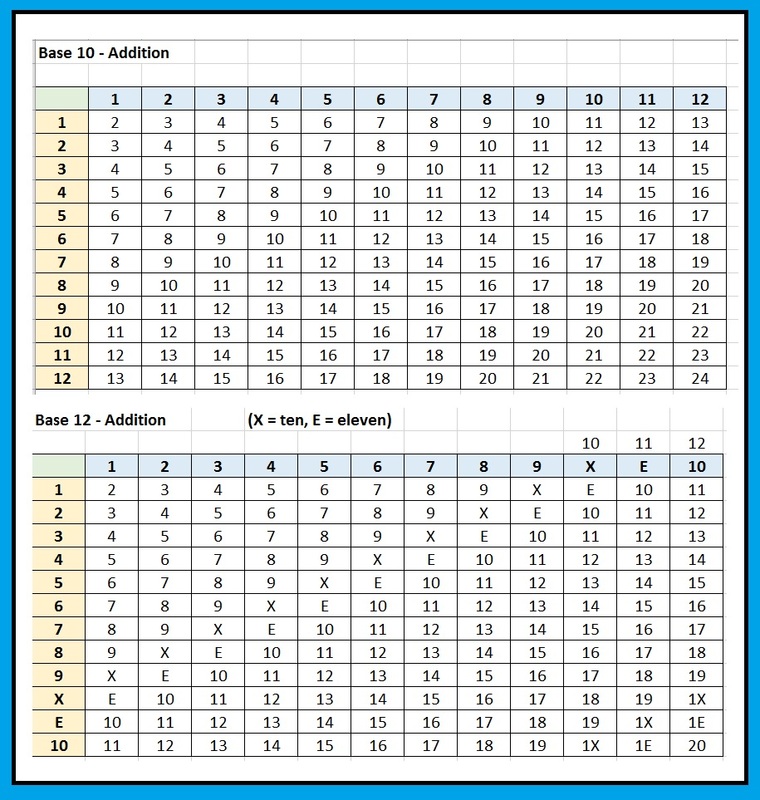 Should it replace base 10 in everyday mathematics? Personally I find value in both systems and the ability to quickly double and halve is partially base 10 has survived as the dominant base system for centuries. In the upcoming week, I work on a program to convert to and from base 10 to 12 integers. I am thinking about either keep the X (dek) and E (el) or using A for 10 and B for 11. A Platonic solid is one of five three dimensional objects consisting of regular polygons which all faces are identical and perfect symmetry is achieved at each vertex (corner). The five Platonic solids are classified by the number of faces they have: tetrahedron (4), hexahedron (aka cube) (6), octahedron (8), dodecahedron (12), and icosahedron (20). The next blog will cover Platonic solids. At least that’s the plan. Have a great rest of the weekend. TI-60X. Yes I forgot the multiplication sign here. Years: 1991 – 1995? 2000? 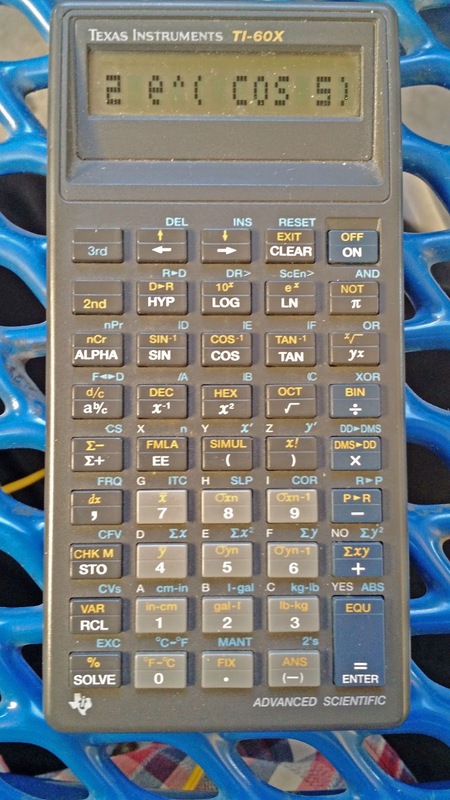 The TI-60X operates in Algebraic mode. Simply, type in the expression as its written, and press [ =/ENTER ]. The TI-60X isn’t programmable in the traditional sense (keystroke or BASIC) but rather you can store formulas (A = π * B^2, for example) for later use. I think the TI-60X is the first of its kind to store formulas. Today, formula storage is a feature of the Sharp EL-520W. More on this later. You have your standard linear regression capabilities. However, instead of the usual labels a, b, and r, you have ITC (intercept), SLP (slope), and COR (correlation) respectively. If find these labels much helpful since calculators sometimes tend to switch the roles of a and b in linear regression mode. Entry is rather easy, just enter the data point and press [ Σ+ ] and you are good to go. No separate declaration of stats mode needed. The Base conversions are on the TI-60X as well. We also get the logical functions AND, OR, XOR, XNOR, NOT, and 2’s (compliment). The TI-60X distinguishes the variables A-F from the hexadecimal A-F by assigning the latter set to the 3rd functions of the reciprocal, square, square root, and the trigonometric keys. On the screen, hexadecimal letters are in bold while storage registers are not. Can we talk about the display for a moment? The text on the TI-60X’s screen is blocky. According to the Datamath Calculator Museum, the character layout is 5 x 4 dots instead of the usual 7 x 5. This display could be a throwback to the calculator display of the 1970s and 1980s where the numbers were made of linear segments. Up to 12 formulas can be stored, and they can have the labels A, B, C, D, E, F, G, H, I, X, Y, and Z. The formulas can have more than one variable. Pressing [SOLVE] allow the user to calculate the formula, with each independent variable being prompted. If there is a numerical value in the independent variable, the TI-60X will display it as a default choice. When the “SOLVE YN?” and “REVIEW YN?” prompts appear, the plus key acts as NO and the equals keys acts as YES. Integration is pretty easy. At the appropriate prompted variable, press [2nd] [ , ] (dx) to insert the dx indicator. You will be asked for a lower limit, upper limit, and the number of intervals. I am assuming Simpson’s method but I’m not 100% sure. Simultaneous equations of 2 x 2 and 3 x 3 linear systems are offered. Execution takes up 2 or 3 registers respectively. Solutions are stored in X, Y, and for 3 x 3 systems, Z. Change to Radians mode by pressing [3rd] [LOG] (DR>) until the R indicator is displayed. Press [2nd] [ EE ] (FMLA). At the “NAME?” prompt, press [ ( ] for Y (ALPHA is automatically turned on at this point) and enter the equation. Calculate y(π/3). Press [SOLVE]. At X, enter π/3. Result: Y = 1.813799364. Integrate y(x) from 0.5 to 1, use 20 intervals. Call up the Y= formula again, press [SOLVE]. At the X= prompt, clear the number and enter dx. Enter the required parameters. 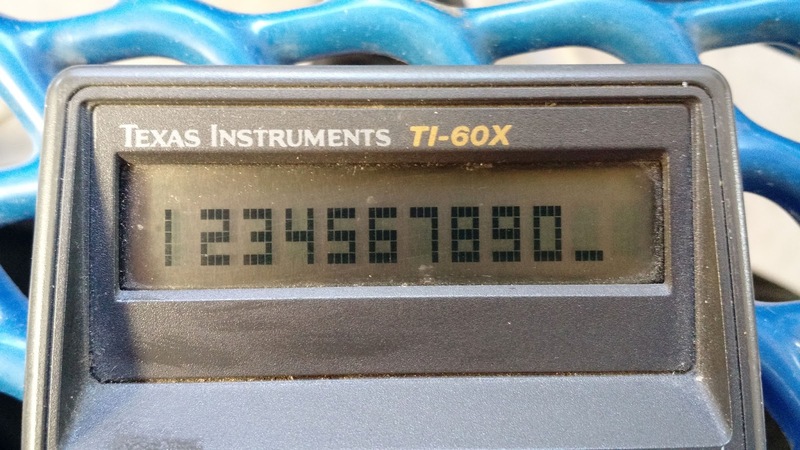 After calculation, the TI-60X displays Y = 0.521068842. The integral is now stored in Y. For what it’s set out to do, the TI-60X accomplishes it rather well. The calculator is rich with features and there is some storage for some formulas. I also like the bolder blocky numbers in the display, they are easier to read. I think the TI-60X launched the advanced scientific calculator genre which is now common place. Yes, this calculator is worth collecting. I’m not sure what the prices are to purchase a used on from eBay, Amazon, or other shopping website, but I imagine it’s not expensive. (I think the 60X was about $30-$40 when it was sold new back in the 1990s).